Blurred lines in New York City governance: whose job is it to save our seas? 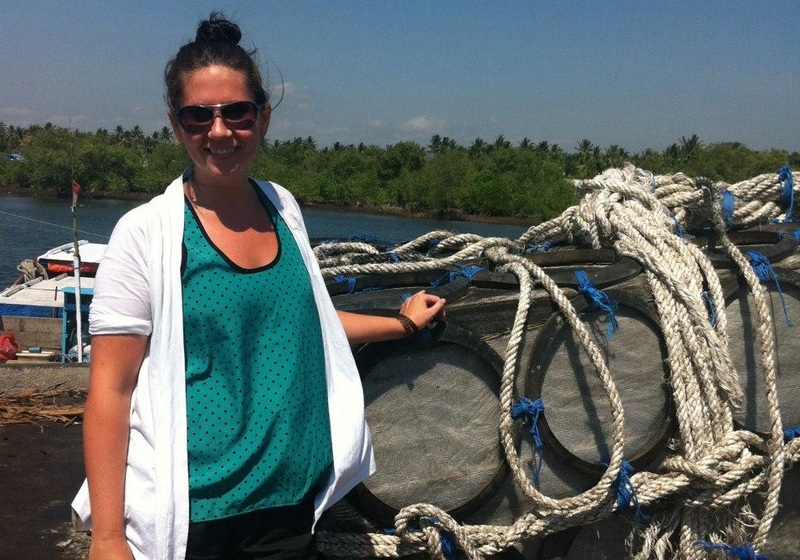 **This is a guest blog post, by Dr. Megan Bailey, postdoctoral researcher at Wageningen University, working in the Best Tuna Research Project. Tuna catch, The Philippines. This one of Skipjack Tuna. All images: Megan Bailey, unless specified. The oceans are in trouble; this is nothing new. Their health is plagued by plastics, pollution, acidification, and overfishing. While many fish species have been overfished, or are currently subject to overfishing, the Bluefin tuna is probably the most iconic of all overfished fish. But whose job is it to save our seas – or more specifically, our Bluefin? Should we look to governments to ward off overfishing or to consumers to eat more consciously? 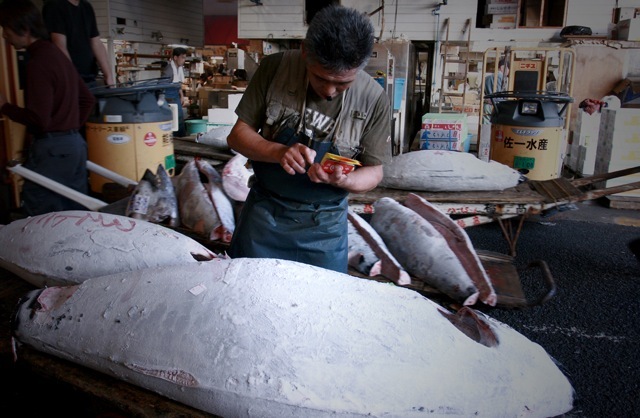 To counter over-consumption, NYC Councilman Alan Maisel, proposed that NYC ban the sale of Bluefin tuna, suggesting that it is city’s job to promote conservation. While nation states are recognized by international law as the stewards of their seas, and are mandated to cooperate with other countries to conserve Bluefin populations, they have, by and large, failed to do so. Even if a country enacts unilateral conservation measures on its own fishing fleets, it can still import that product from other countries – unless a species is listed under CITES (Convention on International Trade in Endangered Species of Wild Fauna and Flora) which prohibits its international trade. In 2010, governments had the chance to add Atlantic Bluefin to CITES, but those opposing the listing, such as Canada and Japan, argued it was not a trade issue; rather they delegated conservation responsibility to regional management bodies. If national governments are not the ones to save our seas – despite their legal responsibility to do so – should it fall to consumers? A plethora of eco-labels have emerged for fish and fish products. Sustainability labels and certifications such as the Aquaculture Stewardship Council, Friend of the Sea, and most notably the Marine Stewardship Council all seek to convey environmental information to consumers, offering the chance to vote with grocery money. In theory, if consumers really do have agency in determining production practices, more sustainable harvesting will follow. The results are mixed: scientists are critical about the impact of such niche products for sustainability, and the ethics behind some certification schemes’ practices. Mr. Maisel’s initiative is a hybrid of the government versus consumer debate. Cities are arising as innovative hubs of environmental governance: banning or limiting plastic bag use in grocery stores, plastic water bottles in city buildings, and the sale of shark fin soup at restaurants. 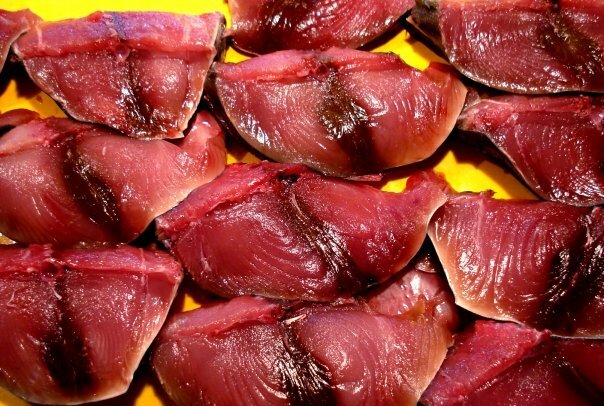 Were NYC to legislate Bluefin sales, it is akin to government regulation. Yet it is regulation geared at consumption, not geared at production. What may be most interesting in this suggested ban on Bluefin by local government authorities, is that this alleviates restaurants interested in sustainability from succumbing to the prisoner’s dilemma. In other words, if any NYC restaurant singularly decided to stop selling Bluefin tuna, it may face adverse consequences as consumers seeking succulent sashimi would take their business elsewhere. Because of this likely first-mover loss, no restaurant would opt to commit to sustainability and over-consumption continues: the prisoner’s dilemma ensues. With a citywide regulation in effect, no individual restaurant must shoulder the risk. 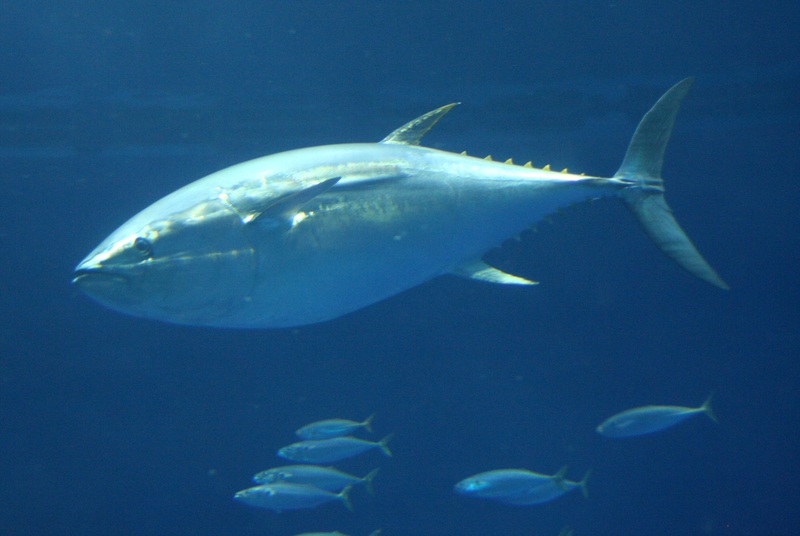 Bluefin Tuna includes three different species – the Pacific, Southern and Atlantic. Any of which could end up on your plate. 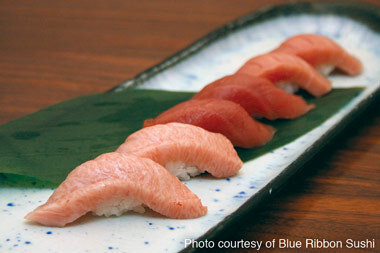 Bluefin are prized for their velvety red flesh that lends itself exquisitely to being eaten raw as sashimi. High-end restaurants in New York and other cities serve Bluefin as a delicacy, and food connoisseurs flock to taste a piece of Heaven while it’s still here on earth – or in the ocean as it were. 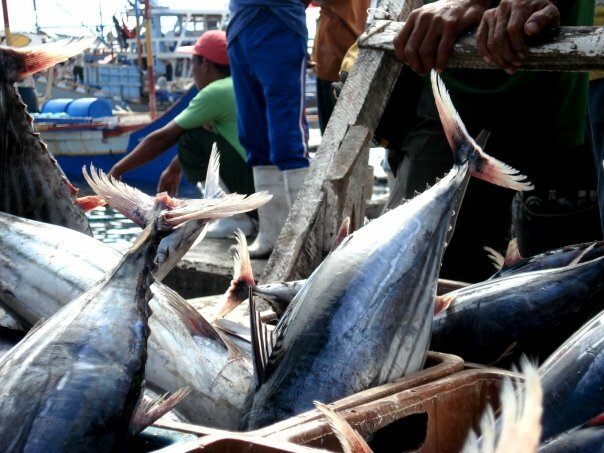 When discussing international trade of tuna or other food products, there is a “product versus process” issue: a country can specify the quality of the food product, but not the process by which it is produced. This means that particular fishing methods (e.g. use of specific hook types, bycatch of other marine species) that may seem unsustainable are not reason enough to ban importation of a given fish product. Excellent post around sustainability and fisheries governance.